Final Fantasy VII will be remade. When it comes to marketing and merchandise production, particularly in terms of media like Movies, TV and Video Games, the people in charge always look for ways to make their works iconic. Not only do iconic moments and lines mean memorability, it also means marketability of products. Every time Saturday Night Live has a catch phrase, it always gets trademarked, movie reboots and sequels always include iconic moments and references whether they fit or not, and while Japan does do things different in a lot of ways, when it comes to marketing in many ways they are worse than the US is in terms of cashing in on classics. There are many, many elements that people associate with Final Fantasy VII that make it iconic: Cloud standing in front of the Mako reactor with his Buster Sword, Aerith gathering flowers in the church and of course, Sephiroth in a sea of flames in the wreckage of Nibelheim. You see these moments everywhere, constantly reproduced. Guess what? Cloud crossdressing is just as iconic. Getting rid of this scene would be like cutting the rolling rock out of Indiana Jones or removing lightsabers in Star Wars. We’re more likely to see this scene get abused and overused than removed. And I believe this is the case of most of FFVII’s quirkier moments. Has anyone actually been seeing the recent trailers for Final Fantasy XV? Or playing the demos? In spite of all the black leather and grayish tones, the characters are still joking around and hell, doing kancho on each other. And for people in the west this is one of those insanely juvenile things that guys would do to each other. It’s like a purple nurple. A team at Square Enix had to write, program and animate that before a voice actor had to sit in a booth and makes noises to go along with the animation. If they bothered to do that I’m fairly certain the Tifa slapfight is safe. In fact it will more than likely be done in such a way that it will take several months just to figure out Tifa’s cleavage jiggle correctly. Crisis Core was one of the saddest, most heartbreaking games Squeenix ever produced, and it’s main character was a human puppy, girl-crazy goofball. Lots of people have been citing Cloud’s characterization in the movie Advent Children as fears that a remake will use this grittier version. I think a lot of people forget what the plot of Advent Children actually was. The movie takes place a few years after the end of of the game, when even when the world was being saved there had been a huge chance humanity would still be wiped out. Cloud and his team faced a global crisis and survived. But in the wake that left Cloud dealing with a lot of stuff, and trying to figure out where his place was now. He never was actually a SOLDIER and he wasn’t about to go back to Shinra. He still felt terribly guilty about the people he lost facing someone he once idolized. None of these issues were dealt with in the game because of the whole, you know, were in the middle of saving the world thing, and Advent Children gave Cloud a chance to deal with those demons and Tifa trying to find a way to help him. 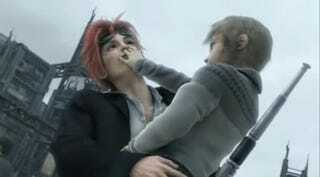 It was why Cloud had the talk with Vincent, one of the few characters who really understood both loss and what it meant to be a part of Shinra, as well as surviving when others didn’t. Cloud was always dealing with PTSD, and the movie gave a chance to actually show it. And at the very end of the movie, Cloud forgives himself and actually smiles! And in spite of that rather deep and important issue (what to do when the fight is over) the movie still managed to find humor. Reno was an absolute clown the entire movie. In fact, he was more serious in the game as the character designs showed him a lot more serious. So to everyone freaking out about the new game, chill. You’ll still get Cloud in a dress, only in HD.